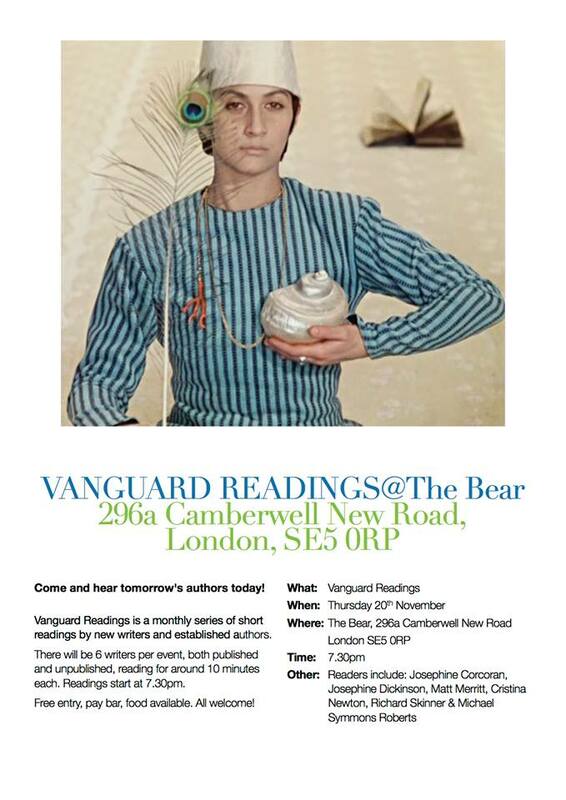 Just a quick post to remind anyone within easy reach of SE London that I’m reading at the Vanguard Reading Series this Thursday, 20th November, 7.30pm. The reading series was created by novelist, poet, and writing tutor, Richard Skinner, who is also Director of the Fiction Programme at the Faber Academy. It’s a monthly series of readings by both new and established writers, usually of fiction, but, twice a year, the focus is on poets. Richard has arranged a terrific line-up for Thursday and I’m honoured to be included. As well as me, and Richard himself, there will be readings from Michael Symmons Roberts, Josephine Dickinson, Cristina Navazo-Eguía Newton and Matt Merritt. I only hope that my nerves won’t spoil the enjoyment of hearing such fantastic poets read. And in addition to the readings, there’ll be the opportunity to buy a copy of the first anthology of the reading series, published by Vanguard Editions. Lots to look forward to. Hope to see some of you there.